Fourth Crusade (1202-1204) - Even though Richard had captured a lot of territory in the Holy Land, he failed to retake Jerusalem. Therefore, the Third Crusade was ultimately deemed a failure. So when a new Pope, Innocent III, took office, he naturally called for another Crusade. However, this Pope would be engaged in a power struggle with the monarchs of Europe and, as a result, they refused to take part. Like the first two Crusades, the message was spread through the efforts of a wandering monk; in this case, Fulk of Neuilly. By 1201 an army of about 35,000 was raised and it would be led by an Italian knight, Boniface of Montferrat. The goal was to reclaim Jerusalem, but not by a direct attack. The Crusaders would strike the Ayyubid dynasty in Egypt, which controlled Jerusalem. However, the campaign got sidetracked before it even began. The only way to invade Egypt was by sea; and so Boniface, along with the help of the Pope, secured the aid of Venice, the greatest sea power in Europe. The problem was the army could not raise the funds needed to meet Venice's price. So city officials and merchants proposed an alternate plan. They would provide the ships if the Crusader army agreed to attack the city of Zarra (today Zadar) on the Adriatic Coast. Zarra had been a part of the Venetian empire, but broke away in 1181; and Venice wanted it back. This split the army in two. A large minority of soldiers were repulsed by the proposal and abandoned the cause. Likewise the Pope condemned any attack on a Catholic city. However, a majority of the army agreed, arguing that it would lead to the greater good of recapturing Jerusalem. So in November 1202, the Crusaders attacked Zarra and captured it in two weeks. Innocent responded by excommunicating the Crusader army (the participants only) and the entire city of Venice. Boniface, perhaps seeing this coming, did not partake in the assault. A Venetian named Enrico Dandolo took over. Now essentially a rogue army, the Venetians decided to use it for their own end. In 1195, Isaac II Angelos had been deposed as Byzantine Emperor and imprisoned by his brother, Alexios III Angelos. Isaac's son, Alexios IV Angelos fled to Western Europe. As his father's heir, he offered to pay Venice a tremendous amount of money if the Crusaders removed his uncle and made him emperor. Boniface was an acquaintance of Alexios and decided to rejoin the army for the second leg of this expedition. The swiftness of their attack, plus help from citizens within the city allowed for its quick capture in July 1203. Alexios III fled, Isaac was released from prison, and he and his son were both proclaimed co-emperors. However, in early 1204, Isaac died and Alexios IV had been extremely unpopular (in large part because of the money that he agreed to pay Venice for his return). He was deposed as his father had been, so once again he turned to the Crusader army which had not yet disbanded. It returned and once again captured Constantinople in April 1204. This second siege was much more violent than the first. The Crusaders looted the city for three days, destroying many of its sacred sites and shipping their treasures back to Venice. Citizens were killed and women, even nuns, were raped. 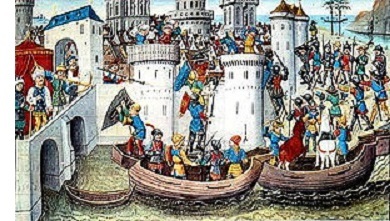 The Fourth Crusade ended up being a conflict between Western Catholic Christianity and Eastern Orthodox Christianity, much more so than with Islam. It represented one of the final steps in what came to be known as the Great Schism between Eastern and Western Christianity.